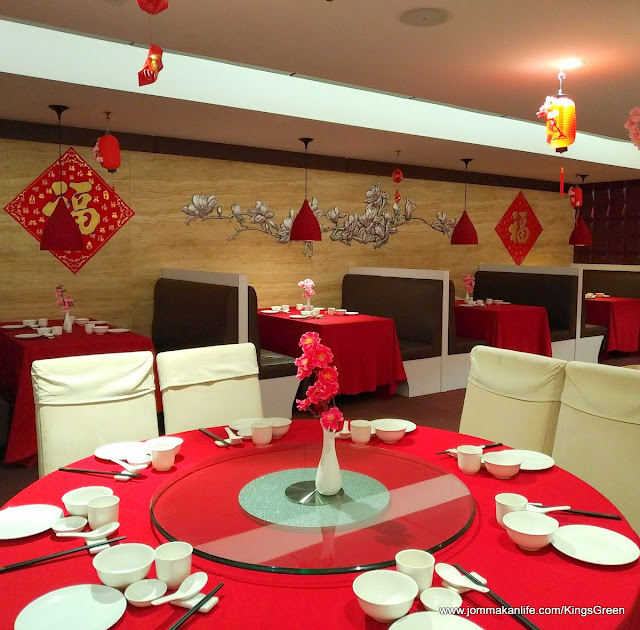 When in Melaka, dine as the Melakans do this Chinese New Year. 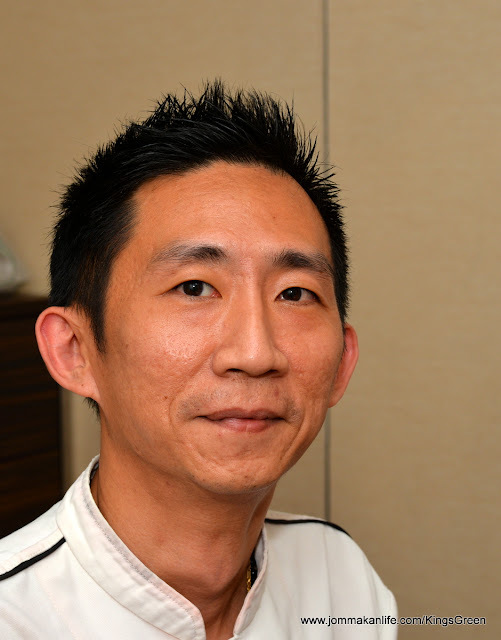 That is Chef Lam Yee Voon of Jia Restaurant, Kings Green Hotel has ensured his CNY set menus feature traditional Chinese dishes alongside Nyonya fare to suit the home crowd. 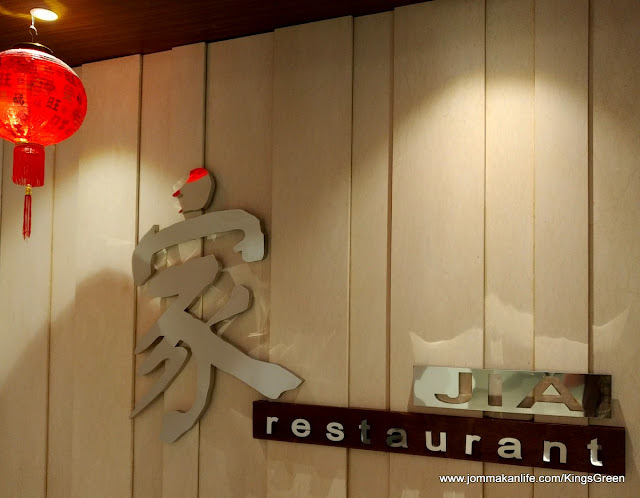 According to the veteran chef, Jia Restaurant will be opened daily throughout the CNY period. 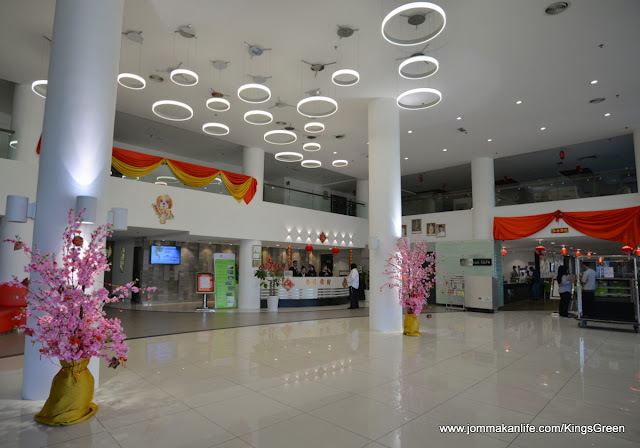 "We anticipate more families and visitors to Melaka will dine out throughout the festival. 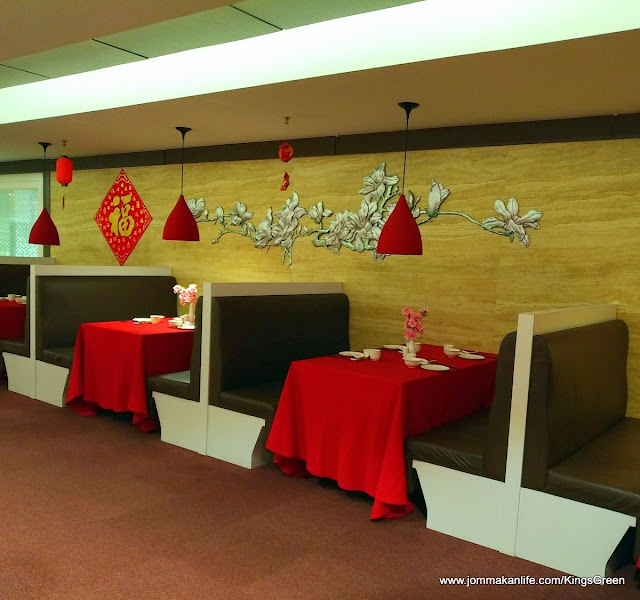 Based on past years' experiences, diners would seek Chinese and Nyonya specialities so we plan to serve both CNY and Nyonya style offerings to cater to them." 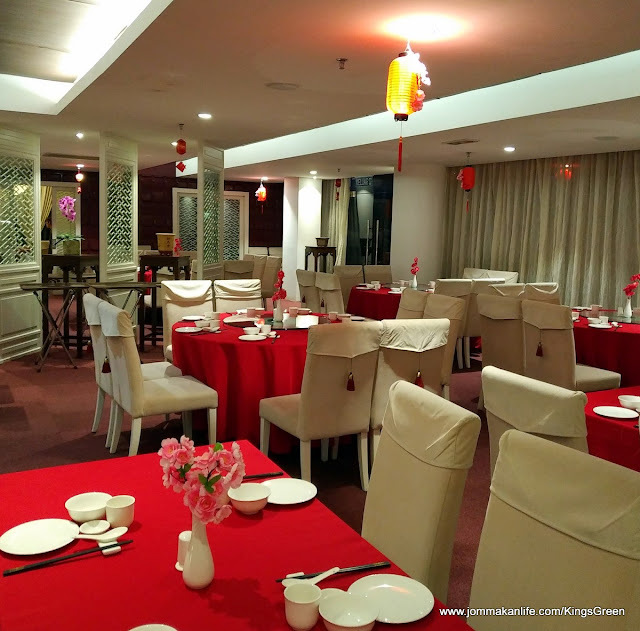 Jia, meaning home or family in Chinese, boasts mainly white and earth tones but in view of the festivities, the interior has been livened up by red lanterns and complementary décor to suit the auspicious celebrations. Three private dining rooms are available onsite and can be partitioned to form a larger space if necessary. 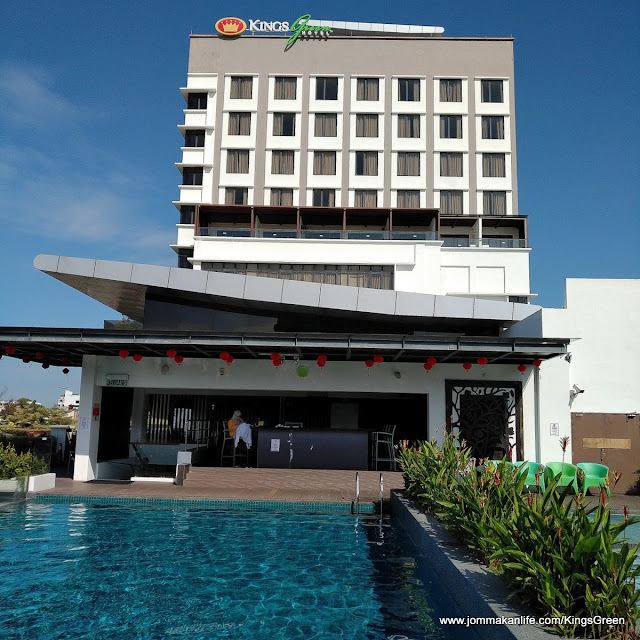 Chef Lam said the Prosperity & Wealth set menu is priced at RM688 nett per table of 7-10 persons and RM488 nett per table of 4-6 whilst the Happiness & Fortune set is priced at RM488 nett per table of 7-10 and RM288 nett per table of 4-6. For our sampling session, he tickled our tastebuds with various dishes from the set menus as well as the a la carte selection. 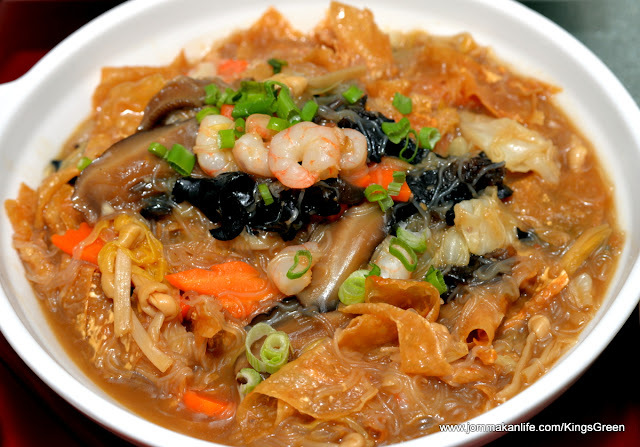 One of the key dishes from Jia’s CNY menus is the delicious Braised Crabmeat Soup with Fish Maw. 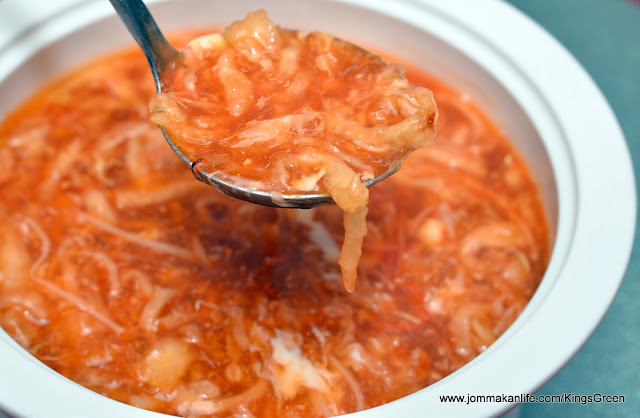 We like the subtly unctuous broth teeming with spongy strands of fish maw and crabstick, and chunks of crabmeat in it. Noteworthy as a PC soup to welcome the Year of the Dog. Hints of Worcestershire sauce came through on the palate when we sampled the Deep-fried Boneless Chicken with Oriental BBQ Sauce. 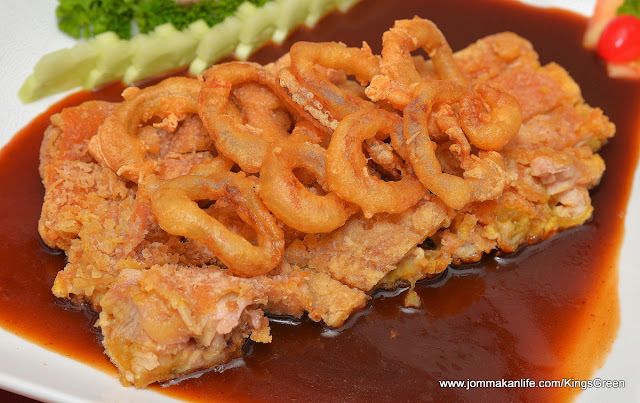 The tender and juicy chicken, sheathed in light and crisp batter, was utterly delectable with the thick brown sauce as were the equally crisp battered onion rings on top. 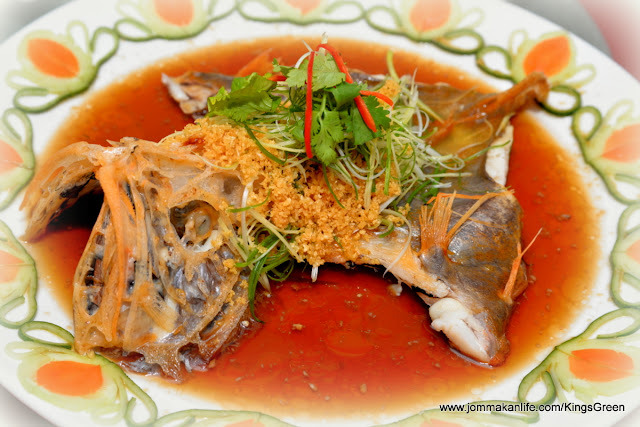 The chef’s two-decade long experience ensured the Hong Kong Style Steamed Orange Roughy hit the mark. Soused in superior soy sauce with shredded young ginger, scallions, coriander and fried minced garlic, the fish’s inherent sweetness and smooth flesh reeled us in for a mini feeding frenzy. 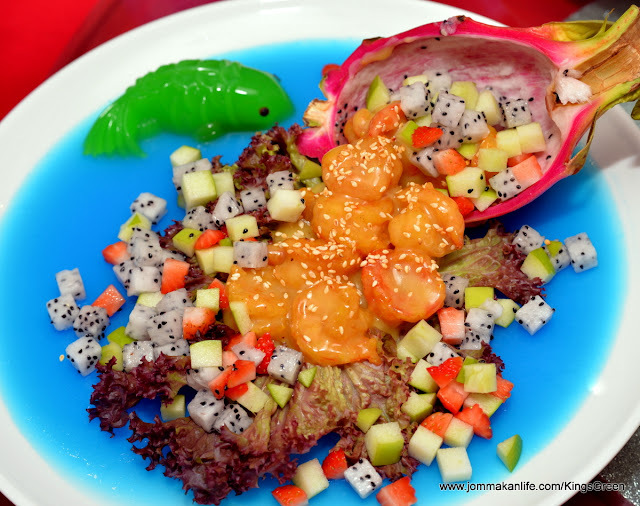 Ramping up the good vibes further was bouncy Deep-fried Prawn Balls with Dragonfruit Salad. 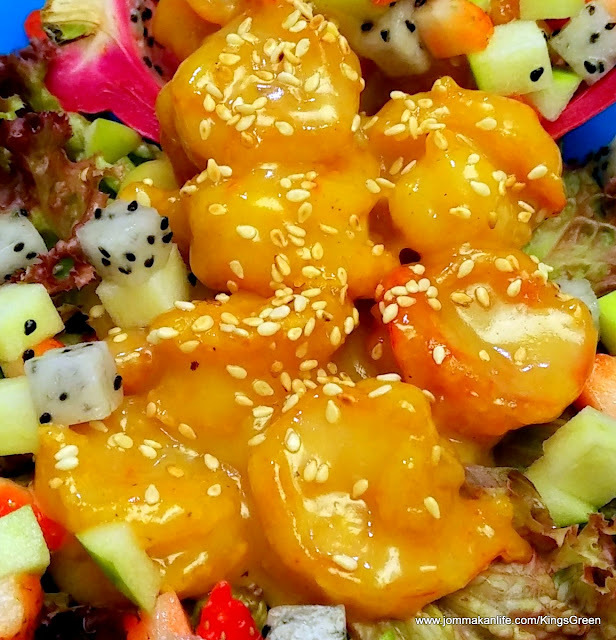 Shelled and lightly coated in a creamy fruity sauce, the prawn balls scored highly with us, forming a winning combo with the salad of diced apple and dragonfruit. 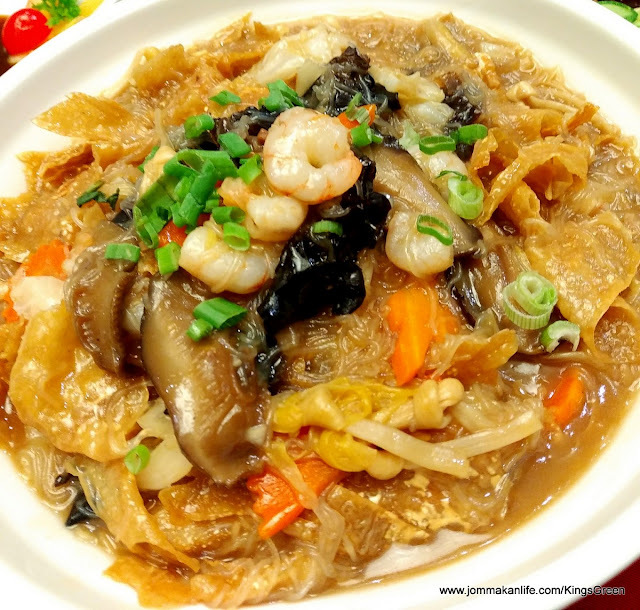 Typical homespun flavours were aptly captured in the simple serving of Chap Chye (RM18) – a classic braised vegetable dish comprising 'golden needles' (dried lily buds), glass noodles, black mushroom and carrot. 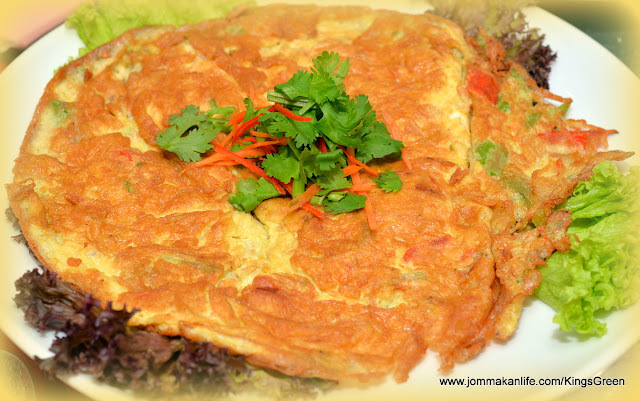 Fluffy Cincalok Omelette (RM12) threaded with onion, cincalok (local condiment of brined krill), red chilli and spring onion - another perennial fave - also hit the spot for us. The savoury umami after taste ensured you won't forget this dish in a hurry. 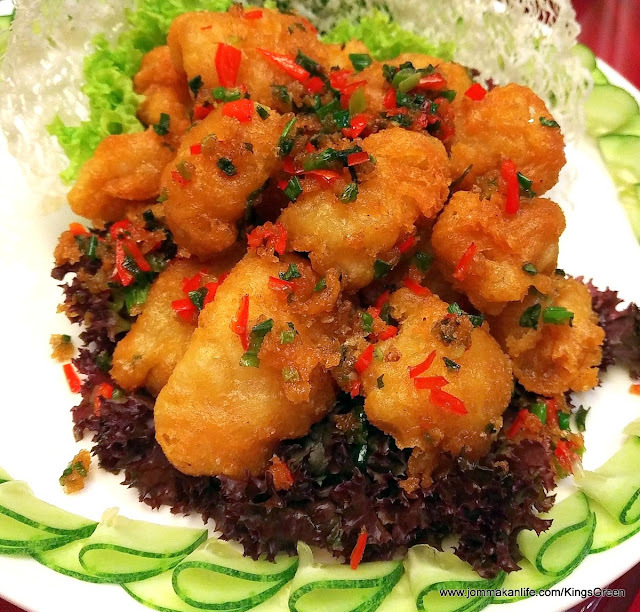 We also ordered a supplementary dish of Deep-fried Squid with Salt & Pepper. Lightly battered, each piece of squid was succulent to the bite. 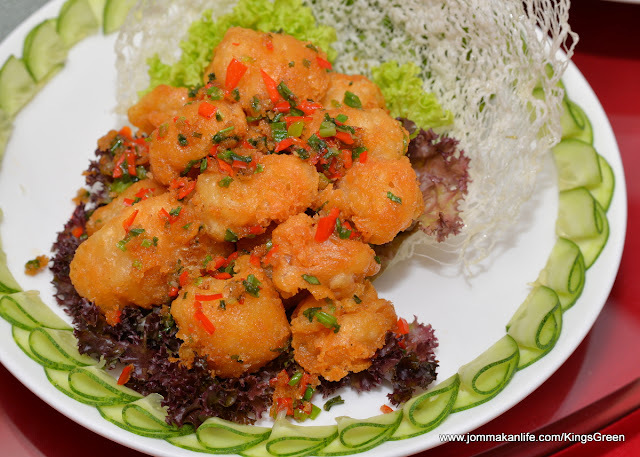 Such Chinese-Nyonya dishes are found in the regular a la carte menu. 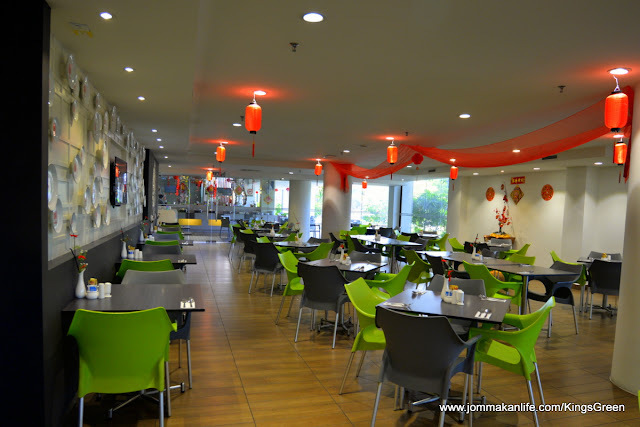 Enjoy greater value from the resto's Daily Set Menus for 2 to 10 persons, priced at RM109-RM360 with complimentary soup, white rice and Chinese tea included. 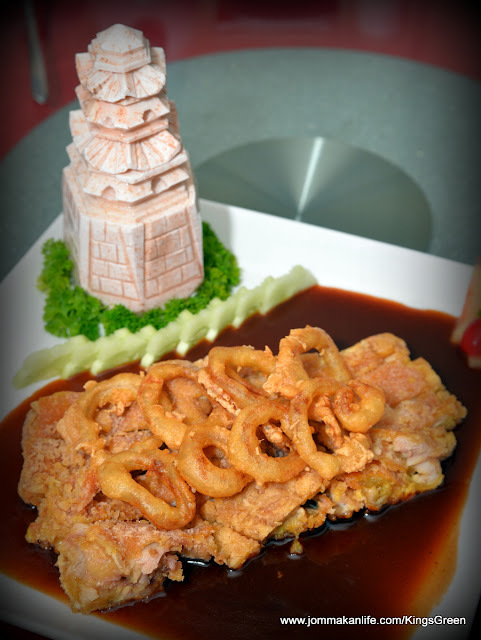 For reservations at JIA (pork-free) restaurant, please call tel: 06 288 1091 ext. 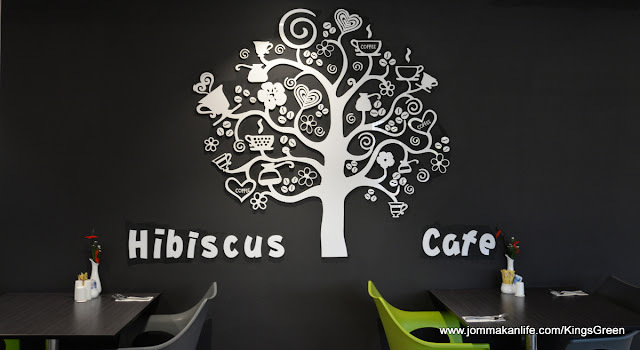 7. Business hours: Tues-Sun from 12pm-3pm and 6pm-10pm. 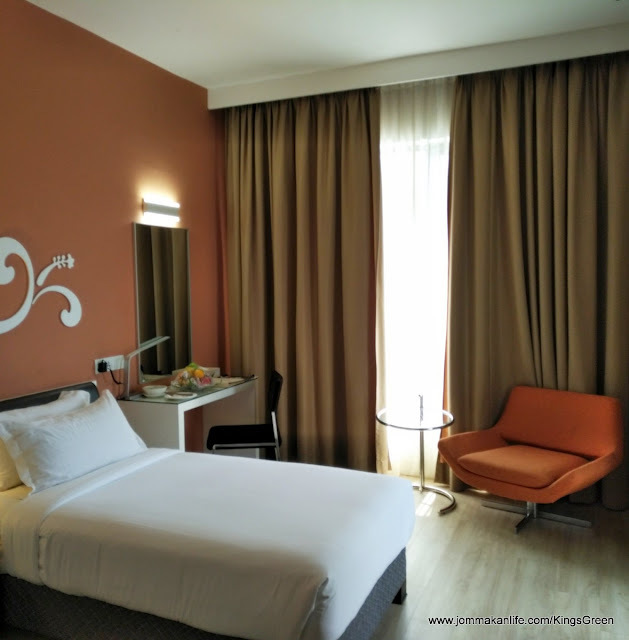 JIA is located at Kings Green Hotel in Melaka - read the review below for details. 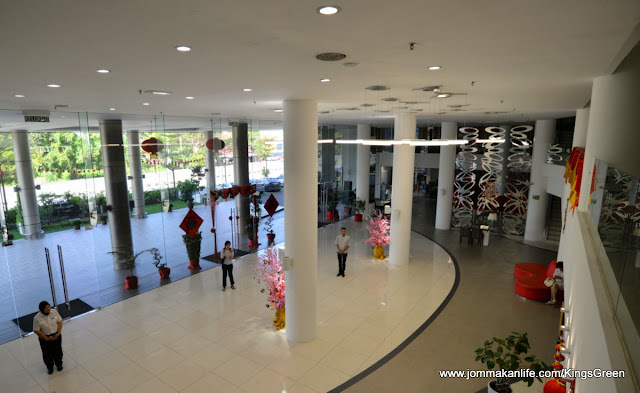 JIA Chinese restaurant is located at Kings Green Hotel, a 4-star property in the historical state of Melaka. 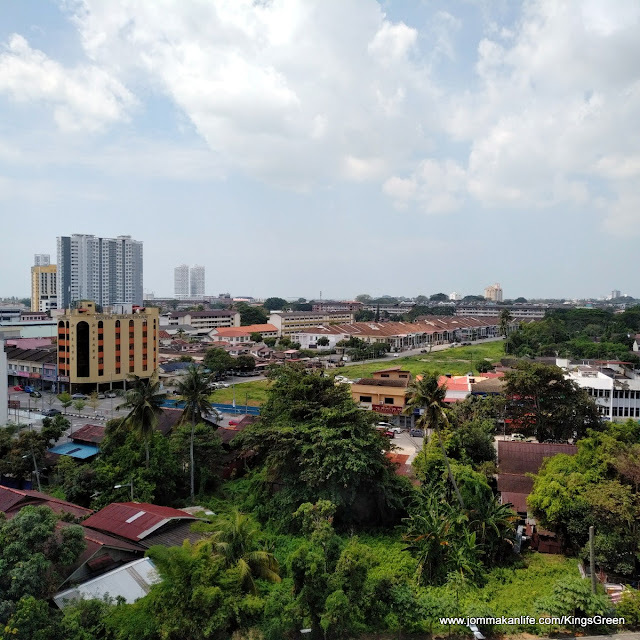 Major tourist spots like Porta de Santiago and Jonker Street are about 1.6km away and the River Cruise Melaka, a 5-minute drive away. 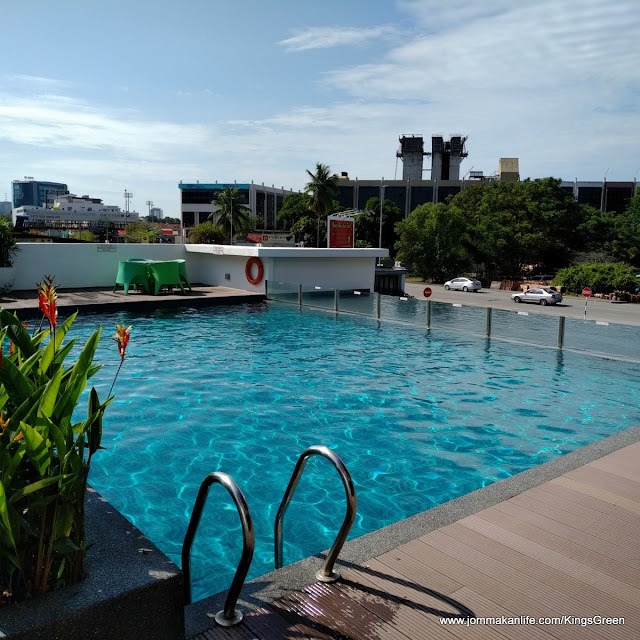 There’s ample parking space and the whole hotel is non-smoking with practical facilities such as a fitness centre, outdoor pool and meeting venues available onsite. 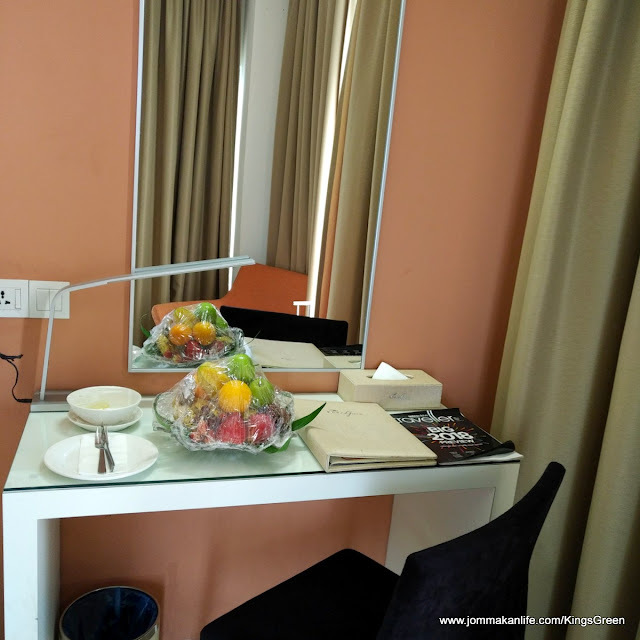 Once we stepped into the boutique hotel, we found ourselves inside the bright, white-washed lobby with soaring high ceiling and modern light fixtures. 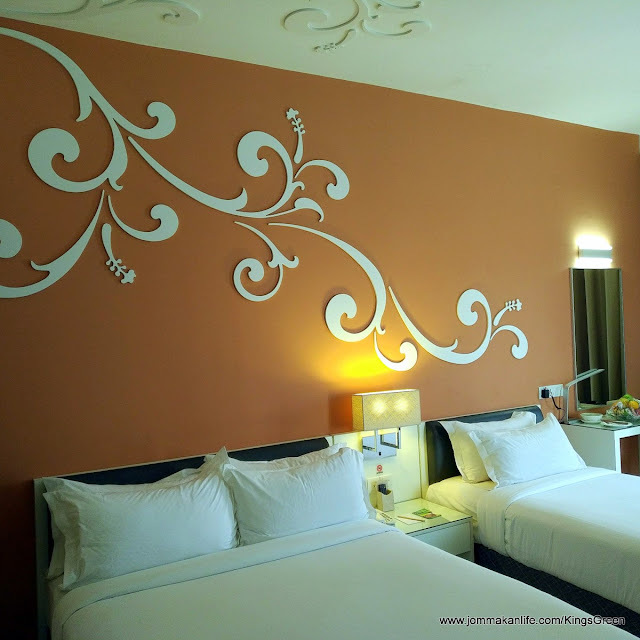 Hibiscus inspired motif in white serves as the focal point in all the 3 category of rooms; distinguished by a feature wall painted in a different colour to denote the room category. 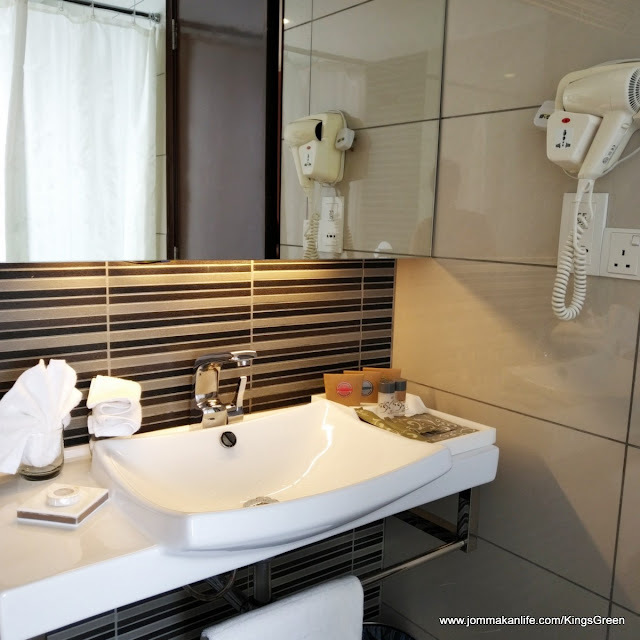 Our Deluxe room was spacious enough to accommodate up to 3 persons, fitting in a Queen & a Super Single bed in it. Since I had to get some work done, the compact executive desk with reading light was sufficient for the task. 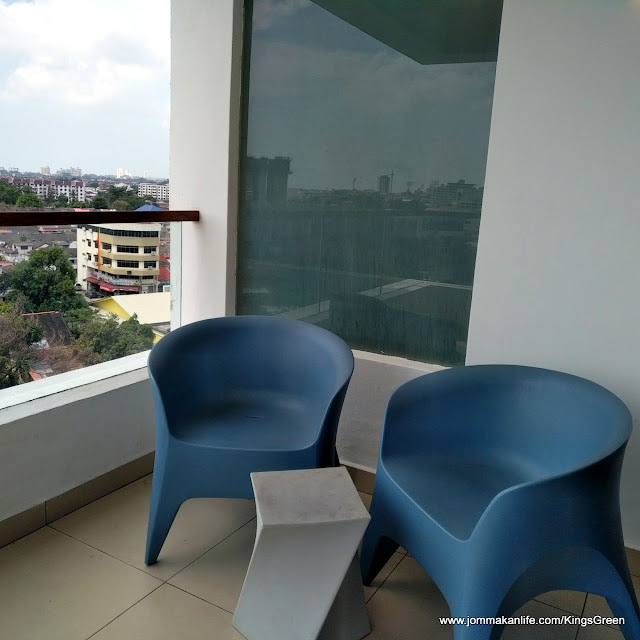 Besides the usual mod-cons: WiFi, air-cond, coffee/tea making facilities and flatscreen telly, there was a small balcony with a decent view, a reading chair with glass side table, wardrobe and a roomy bathroom complete with separate shower and long bath. The shower jet is strong and I like the handmade natural soaps provided. The outdoor pool is of a good size too, with a kiddy paddling pool beside it. I found the fitness centre has enough exercise equipment to ensure health-conscious guests need not forgo their workout routine. 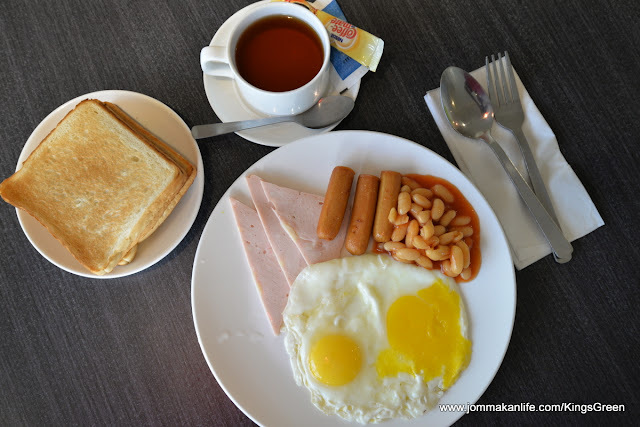 Breakfast is served at the Hibiscus Café; the buffet spread runs the usual gamut of local and Western brekkie fare. 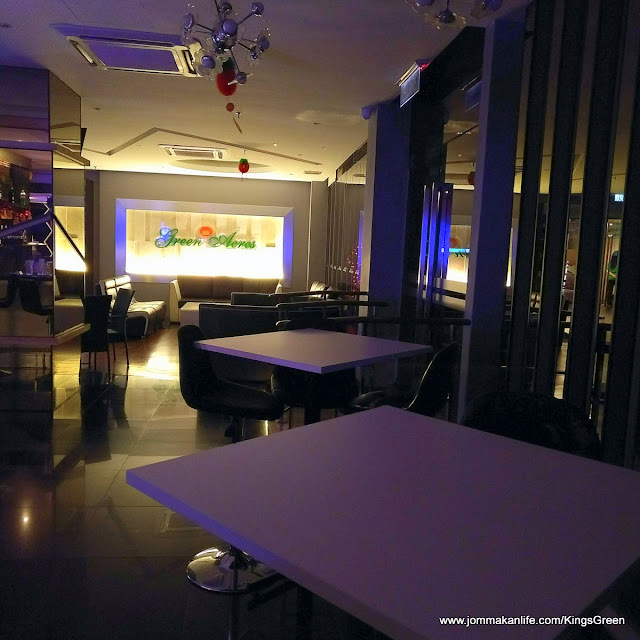 Come sundown, light snacks and drinks can be had at Green Acres Lounge & Bar every Mon-Sat, from 5pm to 1am. A live band belting out chart-toppers and evergreen standards entertains from 9pm onwards. 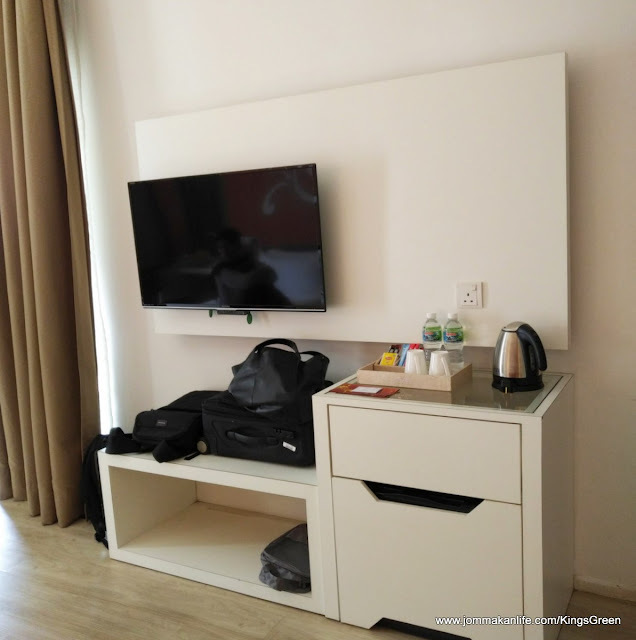 So this Chinese New Year, Kings Green Hotel may worth your consideration if you prefer to stay slightly away from the clogged up touristy areas. 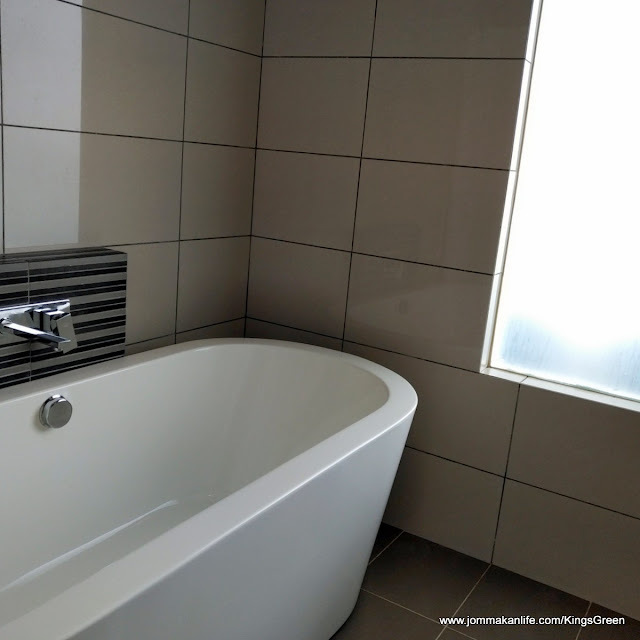 For reservations at KINGS GREEN HOTEL, call tel: 06-288 1091. 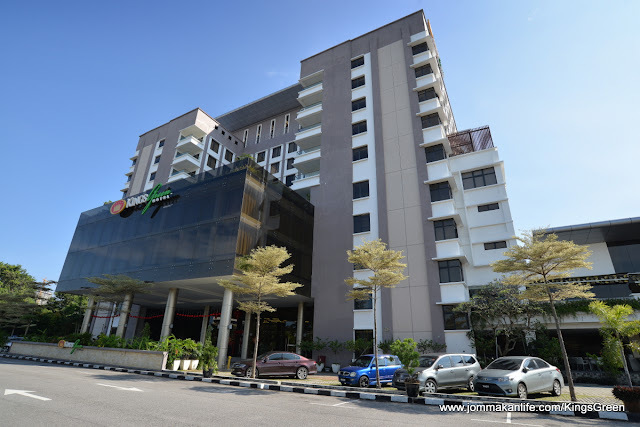 The hotel is located at 28 Jalan Tun Perak, Melaka.